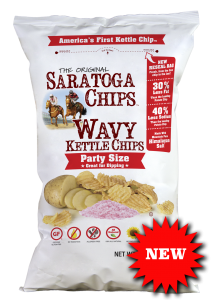 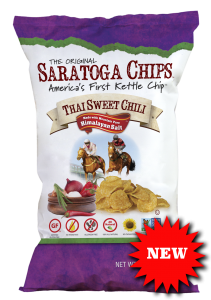 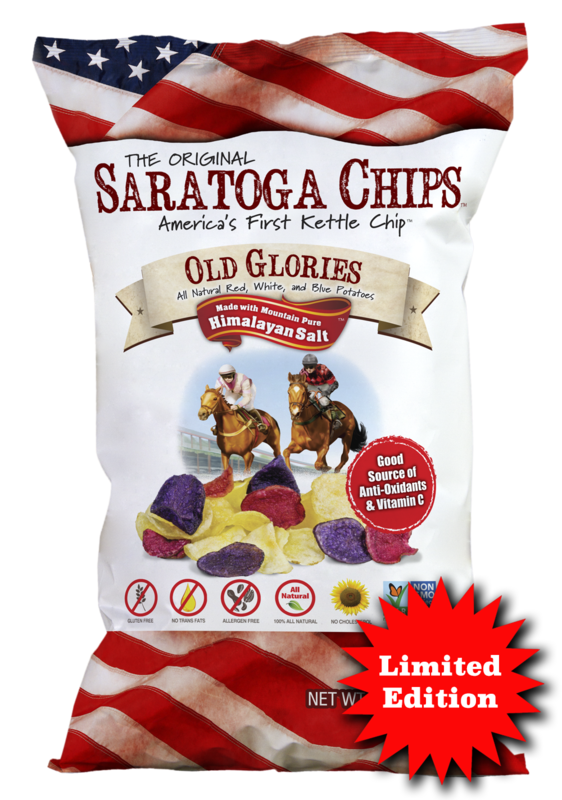 Saratoga Chips Original Kettle Potato Chips are as crisp and delicious as Chef George Crum intended when he invented the potato chip at the Cary Moon’s Lake Lodge in 1853 in Saratoga Springs, New York. These traditional chips, along with the entire Saratoga Chip product line, also contain Himalayan Salt, which is considered to be the purest salt on Earth and contains over 84 minerals needed for a healthy diet. Saratoga’s Dark Russet Kettle Chips are cooked to a golden brown perfection. If you have ever search through a bag of Saratoga Chips, searching for the dark ones…this product is for you! 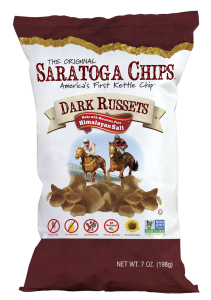 Dark Russets have a rich, sturdy flavor with an unmistakable caramelized potato finish. 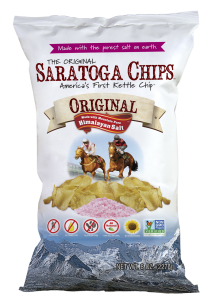 Saratoga Dark Russet Kettle Chips are made with russet potatoes, sunflower oil and Himalayan Salt. 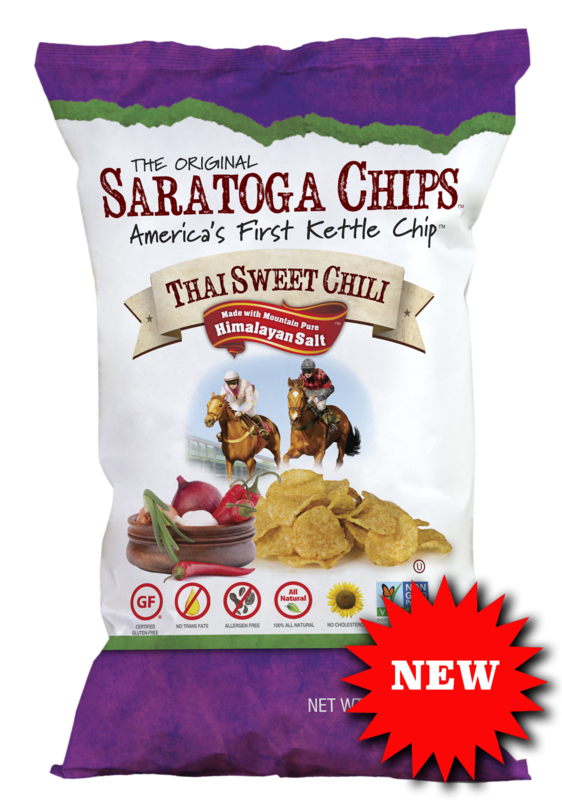 Our Thai Sweet Chili Chips are a perfect combination of subtle spicy chili and sweetness that will leave you craving for more! 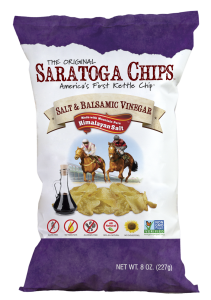 Our Himalayan Salt and Balsamic Vinegar Chips pack a flavorful punch and provide that tangy and slightly sweet vinegar taste you have been searching for! Awaken your taste buds with our Rosemary Garlic Chips! These gourmet chips are crafted in individual batches packed with garden herbs and several varieties of garlic for a Mediterranean taste you will love! Our Honey Barbecue Chips are a sweet honey twist on the traditional smoky barbecue flavor that we all can’t seem to put down! Our Old Glories Kettle Chips are made of Red, White and Blue potatoes and celebrate the American tradition of the potato chip, which were invented in 1853 in Saratoga Springs, NY. These potato chips have limited availability throughout the summer months, so if you see them, be sure to grab a bag quick!